Disclaimer #1: I'm always amazed at how many people find this post still. I literally wrote this on the day I started the blog (May 8th, 2008). Now we all have different tastes, and I pretty much never liked cake flavored ice creams, so keep that in mind when reading this old post. Have a good day! 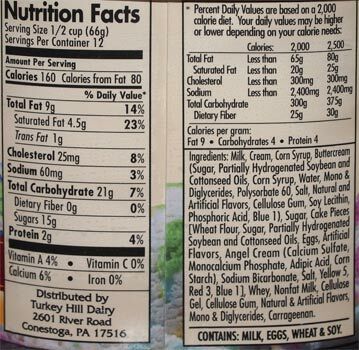 Disclaimer #2: Just had some today (11/1/14), it really isn't that bad! Disclaimer #3: It's now 2015 and I have to ask, did the cake chunks get bigger? That's actually pretty cool. because they've become so very pleasant and add a definite #funfactor in my book. The funny thing is that while I would now be tempted to pick this one up for my daughter, she told me she prefers either Blue Bunny's version or Friendly's version. Oh well! To me, it's wrong on so many levels to waste ice cream, never does it go in the trash.....except once. Yes, I committed the gravest of ice cream sins, I tossed the Ice Cream away and tried to wash away the experience as quickly as possible. 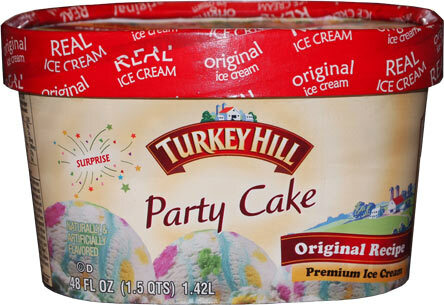 The culprit: Turkey Hill's Party Cake Ice Cream. One mine as well shove their face in a bucket of cheap cake frosting. This flavor was not only disappointing, but it was insulting. Who at Turkey Hill thought this could possibly taste good to all but a small portion of the population? Don't get me wrong, I believe that in general that Turkey Hill ice cream is up there with the rest of the mainstream ice creams (Breyer's, Dryer's/Edy's, etc), but man this was disgusting. I couldn't finish my bowl, let alone the container ...oh so sickenly sweet. 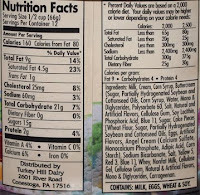 side note: I had an in depth discussion with Turkey Hill when this flavor came out (back in 2000 I believe). In return, I got some coupons and added to their calendar mailing list which I'm still on all these years later. Are you serious? Best flavor of Ice Cream I've EVER had. I agree with anonymous! I just searched your blog to see what you had to say about this delicious ice cream and I can't believe you don't like it! I could eat the whole carton at once lol YUM! I like this cake ice cream alot. 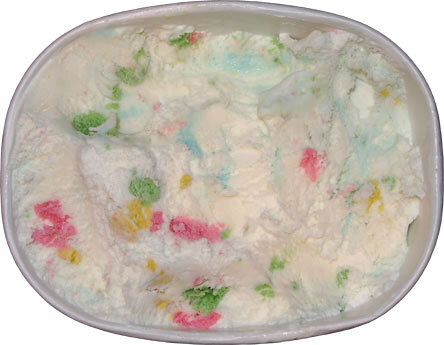 In fact I like nearly all cake ice creams and would venture to say it is one of the most popular flavors now adays. Yes, cake flavored ice creams have come along way with Cold Stone having the most success, but by no means would I say they are one of the most popular flavors. I understand lots of people love it, and it tends to be a hit with the kids, but it has a long way to go before being ranked up there with say cookies n cream. I agree with the reviewer. This ice cream is horrible as it's just overly sweetened vanilla ice cream. The cake pieces add no flavor to the overall taste. For the best cake flavored ice cream, try Blue Bunny because they did it right. This is the only store bought ice cream flavor i ever eat. LOVE it. so much awesomeness in the freezer aisle, why not try something else? Ever think of committing yourself to an asylum? Because you have to be insane or at least very hard to please to think this ice cream is "disgusting". have you ever considered that maybe you don't respect other peoples opinions? This review (from half a decade ago) was the first time I had cake flavored ice cream. I love sweet, but flavors like go from borderline too much to overkill. I love this flavor as well, so delicious! Totally agree, best ice cream ever. I hate most store available ice creams, I don't really like most turkey hill ice creams. I pretty much only eat Ben and Jerry's, but Party Cake is Awesome. I unfortunately don't eat some of the ingredients because they are so artificial and I wish they would make a more natural version of it but as far as taste goes, it is pretty much hands down top 10 store bought Ice creams I have ever had. To the people in the comment section saying that this is the best flavor ever, stop. The reviewer said this flavor is not really that bad. you tried it gurl this is delicious ! This is my favorite Ice Cream ever! Shame on the writer of this article!!! "Shame on me"? REALLY?? Shame on you for not reading the entire post. Ugggg. Delusional? Are you an idiot? Do you not see all the disclaimers on this post? Also, there is an entire freezer aisle full of flavors, try one of them sometime.